Merrimack Valley Havurah : A virtual coffee house for meaningful Jewish discussion. 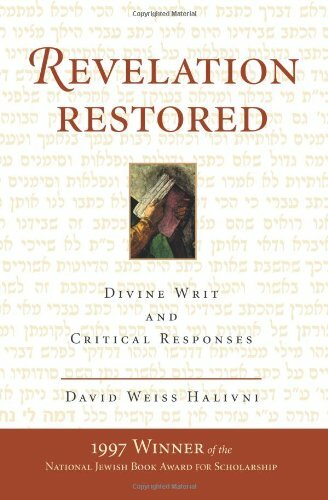 An excerpt from “Revelation, textual criticism, and divine writ” by Rabbi David Weiss Halivni. Published in “Judaism: A Quarterly Journal of Jewish Life and Thought” Spring, 1998. The great difference in our time is that modern sensibilities can no longer accept old solutions on faith. No matter how the textual problems were resolved in the classical rabbinic texts, the modern Jew remains troubled by the very need for such solutions….the modern religious Jew has become ever more unable to believe that maculation in the scriptural Torah does not exist as such. We must therefore begin with the premise that the literal surface of the canonical Pentateuch is marred by contradictions, lacunae, and various other maculations whose provenance appears more human than divine. Both evidence within the later books of the Bible, and more-explicit statements in early rabbinic literature, attest to a restorative editorial role for Ezra the Scribe, the religious leader of Israel at the time of the return from exile. Moreover, this evidence in traditional sources indicates that the notion of an editorial project with respect to the Pentateuch was, in fact, theologically acceptable to the rabbis of ages past. Indeed, the concept of Ezra’s editorial prerogative was employed by several illustrious rabbinic commentators to account for the literal surface of the Pentateuch. (1) According to the biblical account, it was Ezra who brought forth the Holy Scriptures and presented them to the people of Israel upon the nation’s return from captivity in Babylon. It was Ezra who vouched for the written word, ensuring its sacred status with his prophetic endorsement. As the people of Israel repented the sins of the exiled generation and declared their willingness to embrace God’s word, it was Ezra who brought this word to the people. That is not to say that the Torah was revealed by God to Ezra, in effective supervention of the traditional revelation to Moses on Mount Sinai. At least one illustrious rabbinic commentator of the Middle Ages went as far as to claim that it does not matter whether the Torah was revealed through Moses or through Ezra;(2) but even if we speculated that the canonical Torah was revealed anew, word for word, to Ezra, we could not thereby account for persisting maculations in the text. Rather, Ezra’s role, seen from the perspective of tradition, must remain secondary to that of Moses, but central nonetheless. In fact R. Yose, in the Talmud (B.T. Sanhedrin 21b and parallels), states, “Had the Torah not been revealed to Moses, it would have been revealed to Ezra.” This proverbial passage deserves our close attention. No other steward of God’s word could be so aptly likened to Moses in Jewish tradition as Ezra, and yet the difference between these two figures is crucial as well, as the Talmudic quotation suggests. Ezra was not only the final biblical prophet; he also was the prophet in whose time the people of Israel, at long last, embraced the Torah. Whereas Moses must be seen as a passive conduit, the recipient of a perfect, divine Torah, Ezra must be seen as a prophet whose task was to rebuild that Torah. Ascribing this role to Ezra is not only a theological maneuver (that is, not merely a proposition posited in order to uphold faith) but an academic one as well (that is, a plausible historical assertion). Through viewing Ezra’s work as a project of restoration, we may explain the various problems of the canonical text. 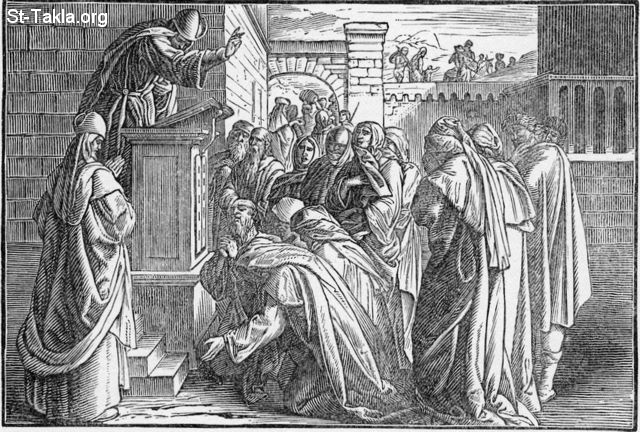 Description: This engraving depicts the Jews standing for the reading of the Law of Moses by Ezra at the Water Gate in Jerusalem. In “Peshat and Derash” I introduced a theological position that I entitled “Chate’u Yisrael” – translated literally: “Israel sinned.” This idea allows the modern religious Jew, appraised of critical responses to the scriptures, to understand how an actual revelation of God’s will at Sinai is compatible with a Torah that shows signs of having been compiled from several textual strands. According to the biblical account itself, the people of Israel forsook the Torah, in the dramatic episode of the golden calf, only forty days after the revelation at Sinai. From that point on, until the time of Ezra, the scriptures reveal that the people of Israel were steeped in idolatry and negligent of the Mosaic law. Chate’u Yisrael, as a theological account, explains that in the period of neglect and syncretism the Torah of Moses became blemished and maculated. The need to reconstitute and canonize the scriptural Torah in Ezra’s time, according to Chate’u Yisrael, arose from the textual difficulties caused by centuries of neglect. Historical and literary analysis supports the modern critical claim that the Torah was assembled from the elements of preexisting tradition. Scrutiny of the historical record, as well as close reading of traditional exegesis, will help us to understand that the Torah embraced by Israel upon the nation’s return from exile was the result of a project of reconstructive compilation. Ezra and his entourage of scribes and leaders brought together a text composed of the most authoritative and sacred writings extant in the Israelite tradition of their day. They presented this work to the people and pronounced it to be the record of Sinaitic revelation. Chate’u Yisrael, as a theological position, allows us to say that the components brought together in this compilation of the Pentateuch, under the prophetic supervision of Ezra, were the remains of an authentic revelation to Moses in the wilderness – a legacy that had become blemished after centuries of Israelite neglect and idolatry in the preexilic age. My position on the revelation at Sinai as the source of the original Torah is analogous to Maimonides’ tenacity with respect to the creation of the world in time. (3) In the first place, no one critical theory of the Pentateuch’s origins has been proven. Almost all the data are disputed among the various factions of scientific scholars. Consequently, I see no cause to reject the notion of a Torah from Heaven. We shall not undermine centuries of faith on the basis of critical theories whose contraries can be made to prevail by means of various sorts of arguments. In the second place, the course that we shall take in examining the scriptures destroys none of the foundations of the Torah and does not give lie to the claims of any prophet. We shall not upset any of the basic and essential tenets of Jewish faith. These tenets, however, would be upset if we were to abandon the traditional view of a definitive revelation at Sinai. The literary evidence of the Bible itself, and of the earliest extrascriptural traditions, demonstrates that the agents of canonization were aware of maculations in their holy text. Remarkably, however, Ezra and his entourage, despite their prophetic stature and their intimacy with the written word, were unable to impose corrective alterations on the text itself. Even as they confronted the need to supplement the written word with adjunct explication, the agents of canonization treated their scriptural legacy as a sacred and inviolable trust. Although the resolution of difficulties emanating from the text was immediately necessary, the scriptural word was not susceptible to alteration, even by those who compiled the holy canon in the period of return from exile. There is ample evidence in the later books of the Bible and in the earliest oral law to substantiate the following two important facts: first, that the literal surface of the canonical Pentateuch was problematic even to its earliest proponents; and second, that, nonetheless, this scriptural word was inviolable. In brief, this inviolability of the scriptures to their canonizers is itself the strongest evidence that the texts compiled into the current Torah were regarded by the scribes themselves as the legacy of a true and early revelation. If we must recognize that the written Torah is a compiled text, encoding the problematic consequences of a difficult history of transmission, how can we still revere this Torah as divine writ? I shall speak of the restorative role of Ezra in supplementing maculated written laws with explanatory oral ones; but I must also address his legacy of text – the canonical written Pentateuch. The theological argument of Chate’u Yisrael also posits that written laws that had become corrupt in the course of Israelite neglect and idolatry were restored to their original intentions by means of oral law. Somehow, for example, the written text of the Pentateuch came to demand “an eye for an eye,” and yet the earliest oral traditions substitute pecuniary compensation. Chate’u Yisrael allows us to conclude that oral law, as a legacy transmitted along with the written Torah, actually restored the biblical commandment to its original state. …Although the exile is a possible explanation for some textual problems, I cannot accept this theory in accounting for all the difficulties of the written word. For one thing, the period of exile was simply too short to have generated a need for the comprehensive reconstruction that evidently took place in the time of Ezra. I prefer to suggest that the maculations of the text, great and small, are the consequence of a more terrible and protracted period of corruption – ages of idolatry and syncretism in the period of Israelite settlement in the Land and in the period of the First Temple. Whatever the cause of textual maculation, one must conclude that with respect to those places where rabbinic law departs irreconcilably from the written word, religious loyalty to this written word cannot have been complete. Some other factor must have entered on the scene. The Chate’u Yisrael theory proposes that the other agent was a restorative knowledge of original divine intent, passed through the generations, most likely by a very small and loyal minority, even as the written text became corrupt. Nevertheless, even if we accept the idea that departures from the written word were undertaken on the basis of original divine intent, we must return to the sacred status of the written word itself. How can a text be holy when it is not followed? Here we must appreciate the legacy of Ezra. The contrite and zealous returnees from Babylonian captivity – the nascent Jewish people – required laws by which to reforge their land and covenant. The religious leadership, under Ezra, apparently was able to satisfy this need, instructing the people on the details of observance. The religious Jew may trust Ezra in good faith. In apparent paradox, the written Torah, if followed to the literal word, may not be valid in religious law. Yet as a symbol of the covenant, it has the highest possible endorsement – the stamp of prophetic approval. If religious Jews are to benefit from any part of critical biblical scholarship – if the onslaught of ideas from the academic realm is to be weathered at all – then some theological response must be attached to this new perspective. There are great benefits, as well as dangers, in embracing a critical outlook. The idiosyncrasies of the Pentateuch itself, as well as the trends and tendencies of rabbinic scholarship, become more comprehensible when traditional understandings are combined with the findings of critical scholarship. Critical scholarship maintains that the canonical Torah was assembled as a composite work, drawing on several distinct strands of preexisting Israelite tradition and arriving at its present form in the period of Ezra. This conclusion is functional, not only as a basis for the critical dissection of scriptures, but also as a starting point for an elucidation of Torah based firmly in tradition. Moreover, although the notion of a compilation under Ezra has been occluded and suppressed by the predominant tendencies of rabbinic thought, it is actually in evidence, not only in the Bible itself, but also in rare but persistent strands of rabbinic oral lore. …When Ezra presented the Torah anew to the returned exiles, he did so not only as the scribal heir to a line of faithful but fallible human guardians. 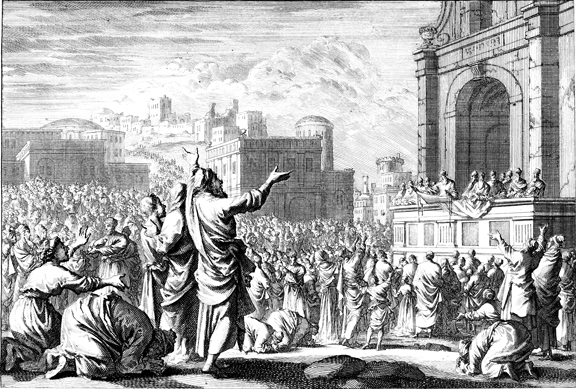 Rather, Ezra presented his canon as a prophet charged by God to a congregation freed of idolatry. Ezra was the first and the last prophet to bring God’s message – the Torah of Moses – to a receptive audience, united, finally, in the spirit of monotheism. Before Ezra, monotheism was not general in Israel and the people were hostile toward their prophets. After Ezra, according to tradition, there was no further prophecy. The unique situation of Ezra – living and acting at a time in which the people of Israel wrought their greatest revolution, reversing almost seven hundred years of rebellion with their enthusiastic reception of the Torah – makes Ezra so pivotal and his mission so climactic. Ezra’s unique position, at the crossroads of Jewish history, lends his canonization its enduring divine imprimatur; moreover, Ezra’s own prophetic endorsement of the scriptures assures us of their sanctity despite all maculation. The religious sensibilities of the Middle Ages required a belief in eternal and unchanging laws, not tainted by the human involvement that inheres in exegesis. 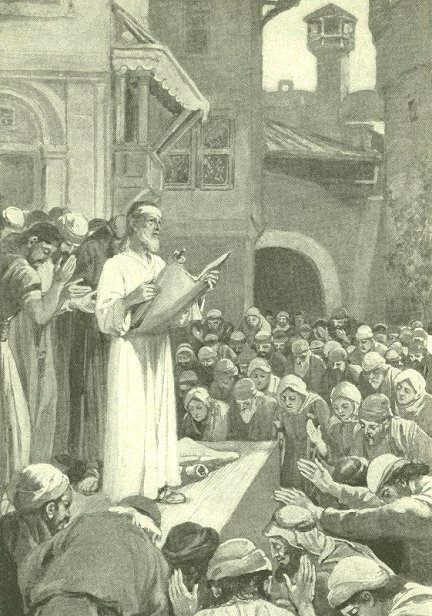 The Jewish theology and jurisprudence of those times – contextualized in Christian and Muslim theocracies and challenged by the exclusively scriptural orientation of the Karaites – needed to maintain that the laws of the Jews had always been as they were: a perfect and eternal reflection of divine intent. The very notion that human beings had been required to mine and quarry for God’s law, even according to the Sages’ principles of exegesis, became religiously intolerable. Religiosity, in the Middle Ages, was an obsession with divine perfection. God’s perfection – unchangeable, unchanged – was so prevailing an idea of the times that the notion of a Torah requiring human involvement was precluded on principle alone. 1. Consequently, as in Peshat and Derash, the role of Ezra, as the biblical prophetic leader presiding at the time of canonization, will be of central importance. Since critics of my previous work have taken issue especially with the role that I ascribe to Ezra, I shall restate my position here, framing the argument that the following pages will support. This clarification will, I hope, dispel some basic misunderstandings of Peshat and Derash that evidently have arisen among its critics. 5. See Isaac Barnays, “Der Biblische Orient,” anonymous, 1 pp. 32-34; L. Duckes, Jahrbuch des Judisch-Literarischen Gesellschaft, 1907, p. 310; Isaac Heineman, Ta’amei Hamitzvot Besifrut Yisrael (Jerusalem, 1956), vol. 2, pp. 164-166, 280. 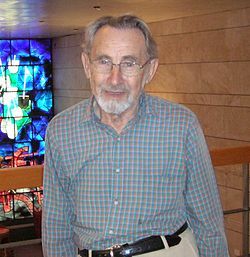 DAVID WEISS HALIVNI, a contributing editor, is a professor of Classical Jewish Civilization in the Department of Religion at Columbia University. He is the author of “Peshat and Derash” and “The Book and the Sword”. This essay is adapted from “Revelation Restored”. Abstract: We would like clear evidence that the Torah is God’s word — if God has spoken to us, we would like to know that God has spoken. But mature, reflective religious belief needs to be based on the recognition that we cannot have such evidence. I contrast here the model of revelation we yearn for with the model of revelation we should accept on reflection by considering two moments in the Bible at which the people gather to hear God’s word: the assembly at Sinai, in Exodus, and the assembly in a Jerusalem square, in Nehemiah. The latter provides us with a better model, I suggest, for how to regard the Torah today. This has implications for Mosaic authorship, the interpretation of the Torah, and the development of halakha.